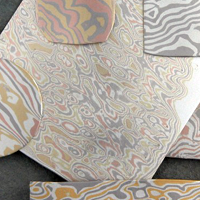 Image from Wikipedia, http://en.wikipedia.org/wiki/Mokume-gane After some experiments with metal such as reticulation and granulation to express a flow which shows movement at all times, I found out Mokume gane is more appropriate than others. Mokume gane is one of the metalsmith skills which was invented from swordsmithing around 1650s in Japan. However, the technique was suddenly decayed when Japan opened its door to the world because consequently Samurai swordsmithing was lost. After Japan shared their culture with overseas, the mechanism of Mokume gane making was deeply investigated and moreover, its technical process was developed in the USA while making Mokume gane was rarely seen in Japan. It is Mokume gane’s lot to be decayed and this fact has strong connection with my personal emotion which is sadness about the loss of traditional skills. The skills mean Mokume gane but also other skills in different craft fields. Now, I would like to represent the fact that everything will be decayed at last using Mokume gane which was nearly perished before.